According to VWN, the most important product and symbol of change is the ID. Buzz, which will be built in Hanover from 2022. “But because no one can predict exactly how quickly customers will accept our e-vehicles, we will maintain a high degree of flexibility at the Hanover plant in the coming years,” Sedran says. “We are preparing for the production of battery electric vehicles. 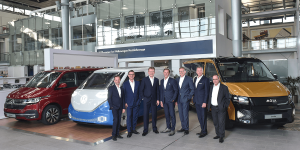 At the same time, we can continue to build multi-vans with combustion engines, including plug-in hybrids.” That doesn’t sound like the BEV march that VW CEO Herbert Diess has been drumming these days. The new generation of the T7 van will not be launched on the market with a purely electric drive as assumed, but will only be available with a plug-in hybrid drive from 2021, in addition to the diesel and gasoline engines. However, the facelift being given to the T6 (called T6.1) will be available as an electric version from autumn this year. Analogies with VW’s passenger car strategy cannot be dismissed. For example, the Wolfsburg company has also not planned an electric version of the Golf 8, but the ID.3 will be available soon. The same applies to the T7: the new generation of the van will not be available as a BEV, but customers will have the ID. Buzz in prospect. As far as new mobility services are concerned, VWN wants to make use of the know-how of the still young VW subsidiary Moia, which is known to rely on fully electric shuttle buses based on Crafter. Basically, the group-wide development in the field of autonomous driving is to be bundled in Hanover in the future.